As mentioned yesterday, while you’ve been sleeping, I’ve been out working. This happens every so often to a humble narrator. Circadian rhythms short circuit somehow, and a distinctly nocturnal phase occurs. Desire to record scenes observed remains, however, and specialized kit is required. 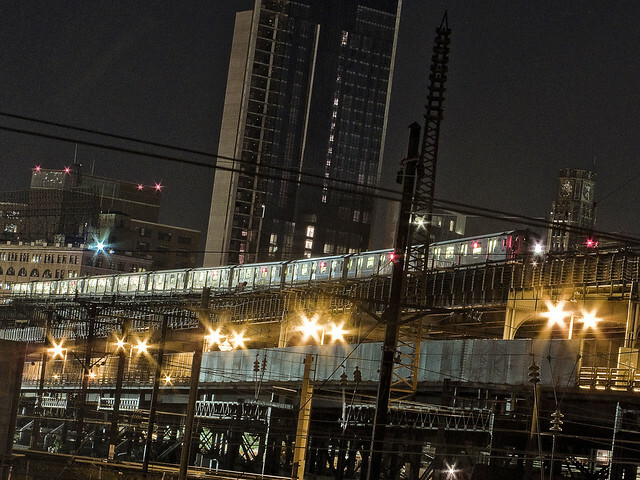 Queens looks so interesting at night, as the concrete devastations are generally well lit. 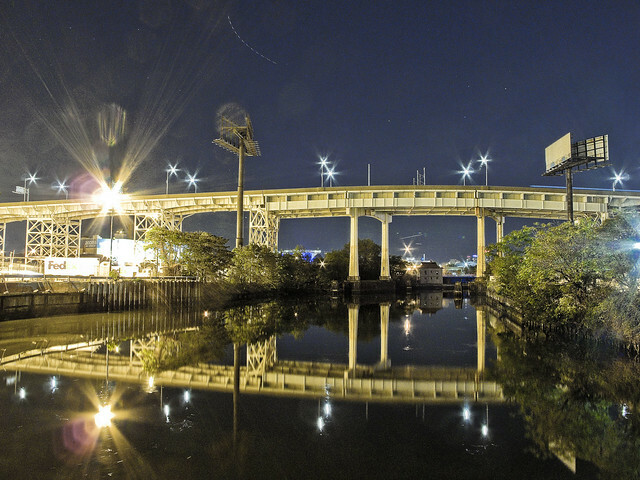 Above – the Long Island Expressway’s 106 foot trussed apex over the Dutch Kills tributary of the fabled Newtown Creek. This sort of shot is tripod country, of course. 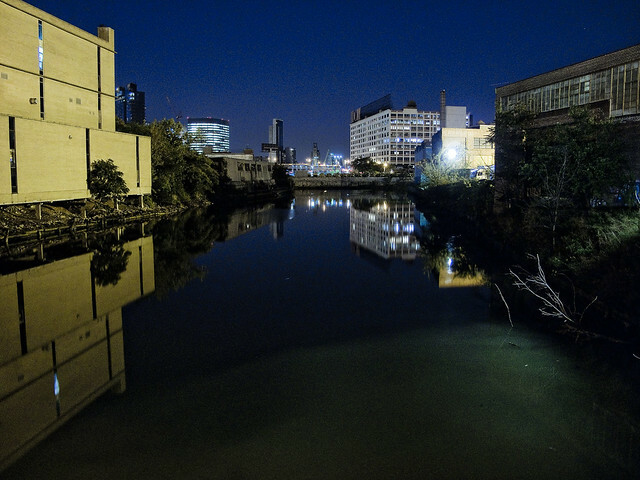 Looking north along Dutch Kills in the direction of the Sunnyside Yards and Queens Plaza, a scene familiar and loved, for it depicts the waterway’s turning basin which once fed maritime traffic into the Degnon Terminal via a barge to rail facility. These shots were all captured using my trusty old Canon G10, btw, mounted on a magnetic tripod. This particular bit of camera support allows a secure connection to ferrous surfaces via the use of multiple rare earth magnets, which in the case of the shot above was the Hunters Point Avenue Bridge itself. The magnet tripod, in effect, transforms the bridge itself into a tripod via its electromagnetic grip. These are ISO 80 15 second exposures, captured with a narrow aperture – f8 – for those of you who are curious shutterbugs. Additionally, the light meter was set to the “tungsten” temperature, which caused the light captured to favor the blue side of the spectrum rather than the oranges and reds which street lighting normally produces. The camera was outfitted with a remote release cable, and I just had to time out the sequence of traffic lights on either side of the bridge to ensure that passing vehicle traffic didn’t introduce a ruinous vibration to the bridge which would transmit up to the lens. Walking back to Astoria in the darkness along Skillman Avenue from Dutch Kills, certain apertures in the fence lines of the Sunnyside Yards allowed me to secure and trigger the camera fortuitously. The 7 train, notorious for its multitudinous and unexplained delays, was just sitting there waiting for a humble narrator to record it.